View from stage of Boyd Sibley, keyboardist for the band HOPE, performing onstage at the Sound Storm music festival. There is a cowbell on top of the Hammond "D" and a large crowd is in front of the stage. The campground area on the hill can be seen in the background. 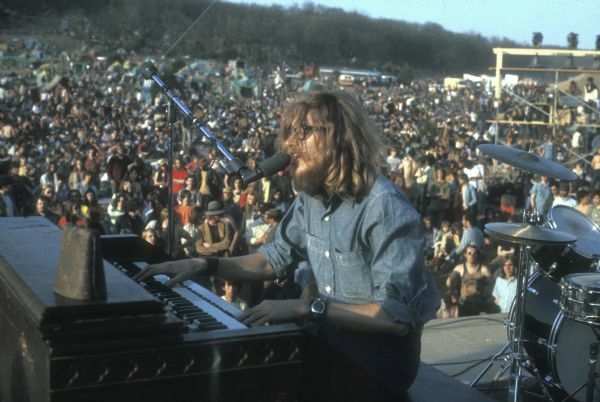 Sound Storm was a rock concert that took place at York Farm in Poynette, WI on April 24-26, 1970, featuring The Grateful Dead, Crow, Illinois Speed Press, Rotary Connection, Baby Huey & the Babysitters, and many other acts.